The best cities are the ones that provide an experience worthy of your every mood—like a grab-bag of spontaneous cravings and uncharted new loves. That’s Austin in a nutshell. 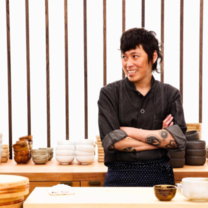 Local Yoshi Okai of Otoko leads the way as Melissa Chou of San Francisco’s Mister Jiu’s discovers sashimi infused with the spirit of Texas, a game-changing taqueria, and a legendary rock club or two. Brought to you in collaboration with Visit Austin, featuring music from locals Capyac and Calliope Musicals! "Kanpachi Crudo @ilbruttoaustin w/Mango and Fennel"
"Yup other day!! 🍜🍜🍜 It was awesome!!" "Hassun : (L-R) Kale Ohitashi w/ white sesame, Okoge(crispy rice) w/ Sushi nori purée, Lotus root w/ karashi musturd and Ikura, Kanpachi Jamón w/ Ume and Shiso, Sawagani w/ kurage and kikurage. ⛩🍶"